Good. Foxing/tanning to edges and/or ends. No dust jacket. Fair. The hinges are in good condition. Haven't read this book yet. Ordered it ahead for a book club discussion in December. Plan on reading it the end of the year. Set in Monterey's Cannery Row, Steinbeck tells the story of a beleaguered writer trying to write a book but who is beset by personal doubt and frustration. The locals, including the madam of the Palace, contrive to keep him assured. Into the picture comes a young woman, apparently adrift and homeless, whose abilities belie her assumed status as a prostitute, and the madam understands this but gives her refuge in her establishment. How this girl rescues the writer and gives him life, finally, makes it one of the sweetest and most poignant tales I have read. 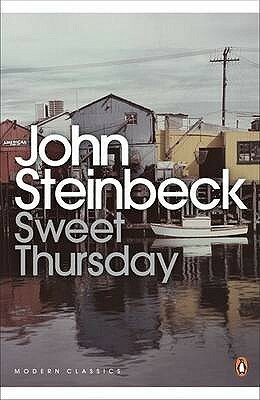 Full of humor as well as pathos, it is a must read for any who like Steinbeck. When I think of John Steinbeck, I think first of "Cannery Row". Sweet Thursday is a companion book to cannery row. It is a soft, relaxing, easy read. One can easily picture the area and the characters exemplified in this novel. It is one of my favorites.